Happy Fourth of July!!! /Hawks Aloft Inc. The Fourth of July is the day we celebrate our American Independence, but bird lovers in New Mexico also celebrate another event that typically happens right around the beginning of July. 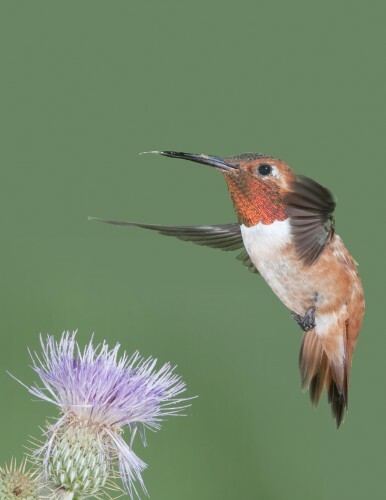 Rufous Hummingbirds start to pass through on their fall migration! The male Rufous Hummingbirds have a bright orange, iridescent gorget and rufous-red head and back. They are the feistiest hummingbirds you will see at your feeders. 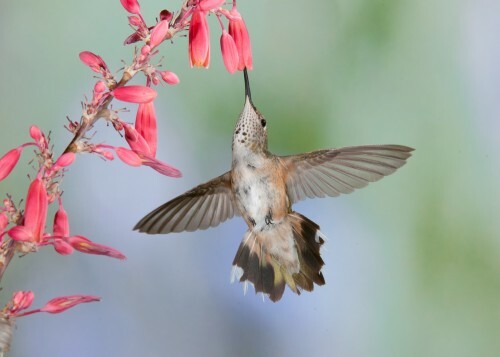 They guard the feeders tenaciously against other, often larger hummingbirds that need a little drink. Typically the first Rufous Hummingbirds we see are the males, and later in July and in August we see the females and first years. The males are free to migrate home first, because they contribute very little to the process of raising babies; in fact they are just sperm donors. The female does all the hard work of building her nest and raising the babies. 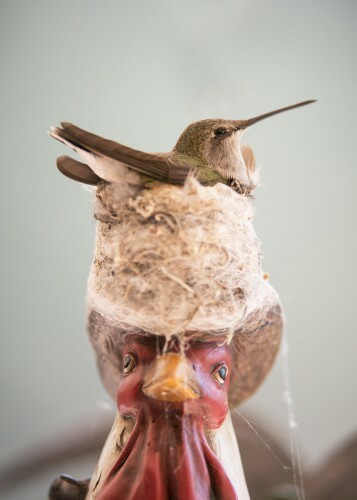 David Powell captured this female hummingbird sitting on her nest in Albuquerque, NM. A major component of a hummingbird nest is spider silk. This allows the nest to grow along with the nestlings. 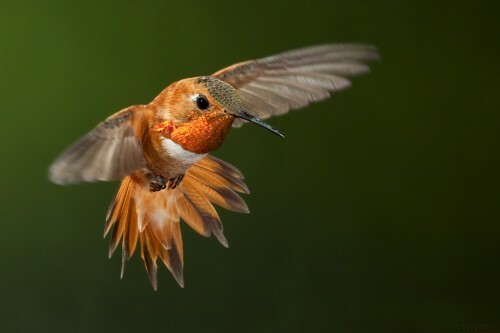 Rufous Hummingbirds breed further north than any other hummingbird, and are seen as far north as Alaska. In fact I saw a beautiful male Rufous Hummingbird in early June of this year in Halibut Cove, Alaska. 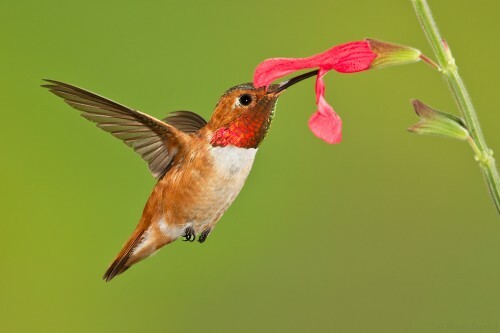 Like other hummingbirds, they eat insects as well as nectar, taking them from spider webs or catching them in midair. 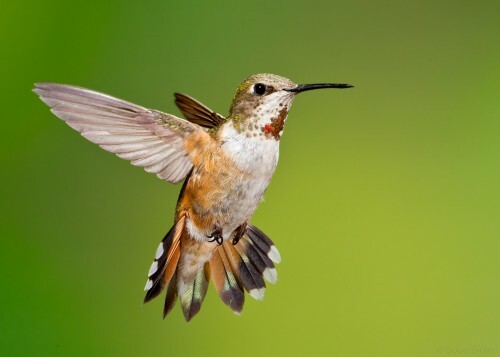 Rufous Hummingbirds are also unusual in that their spring migration follows a route along the Pacific coast while their fall migration goes through the Rocky Mountains and right through Albuquerque. 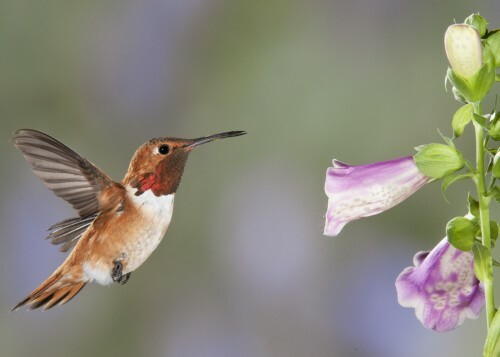 I just saw a rufous humming bird today, November 27th, in Vista, California! Is this normal? You said spring migration is along the pacific coast. What a great sighting! Hummingbird movements have changed in response to climate change and also the use of hummingbird feeders by bird-loving citizens. In some cases, hummingbirds in the eastern United States are no longer migrating over the Gulf of Mexico, but spending the winter in our southern states. The same could be true in California. In New Mexico, where we are based, a small number of hummies are overwintering, thanks to the support of feeders. AUGUST 1 2017 I HAVE A MALE RUFOUS GUARDING ONE OF THE FEEDERS JUST SOUTH OF BELEN NM.